Priced per running metre - width of rolls 1.37 metres, so each unit purchased is equivalent to 1.37 square metres. Reduce noise to aid comfortable driving with our range of underfelt. Underfelt is a must to support your carpet and lengthen the life of the set. 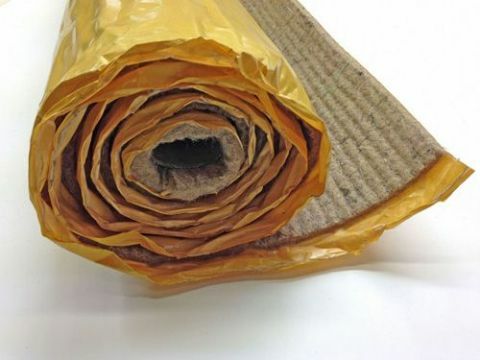 This is a traditional jute felt and meets the British Standard BS5852 for fire retardancy. The use of such high standard raw materials goes hand in hand with our carefully controlled manufacturing processes to produce hard wearing, high quality products. Please note that the underfelt has a width of 1.37m (54") and is approximately 1/4 to 1/2" thick. Underfelt is also available in standard or latex backed one side. Delivery can be split between two categories, 'made to order items' and 'stock items' . These relate to items that have to be made such as carpet sets, felt kits etc. These are hand-made to order on site, so please allow 1 week for delivery. Waiting times vary throughout the year and at very busy periods may take longer. This relates to items such as carpet on or off the roll, car covers, vinyl, glue, thread etc. Orders placed before noon and in stock are despatched the same day. Most UK parcels are currently despatched using TNT. Whilst this is not a guaranteed next day service 98% of parcels are delivered on the next working day*. Typical prices for UK delivery are £9.99 mainland areas or £25 for surcharged areas above. If you are overseas please allow 24 hours for despatch. We use a variety of couriers for this. Parcels are shipped worldwide daily, we have a lot of experience in this and will be able to answer any queries or doubts you may have about overseas shipping. Rest of the world e.g. USA, Canada, Australia etc. please contact us for a quote. Price based on final weigh and dimensions of finished parcel. For further information please refer to our terms & conditions.